Don’t wear your heart on your sleeve, wear it on your leg!" As you Glossers probably know, printed and patterned shorts are a hot item this summer. But as poor college students, sometimes dropping the dough on shorts isn’t exactly in our summer job budget. This is why you read my column, friends. 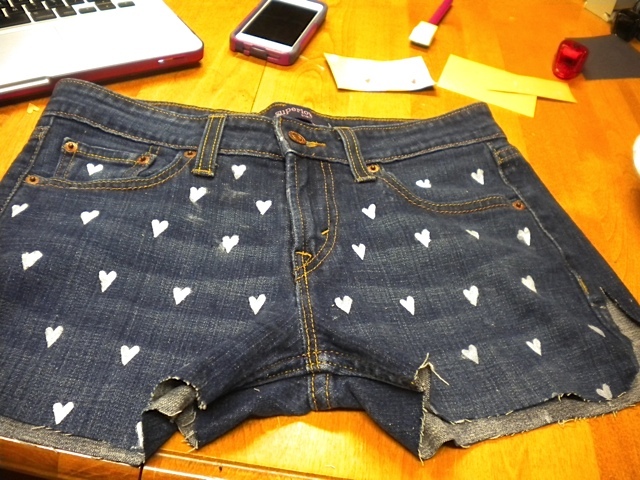 Some adorable shorts could be yours for the low price of some fabric paint and maybe thrifted jeans if you don’t have old jeans or shorts to use. 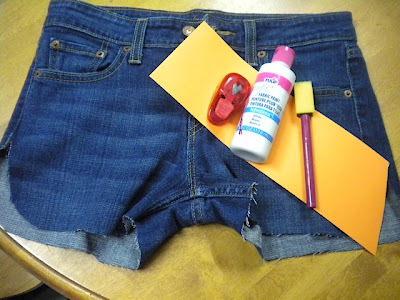 The DIY I was inspired by used long jeans but, with it being summer and all, I took the liberty to hack some jeans into shorts. For those who aren’t experienced at this craft, use a ruler or tape measure to figure out how long you want the in seam and then mark and cut them at that measurement. Always start with a bit longer of a inseam than you think you want and try them on to figure out if you need to cut more. But,feel free to keep them as full on jeans if you want them to be for the fall and winter and those other cold weather times. Now that I gave you a CliffNotes version of cutting up your jeans, lets get on to the actual pattern part. For making the heart template, you can use the preschool method of folding your cardboard or cardstock in half: draw half of a heart and cut it out, so when you unfold it looks like a whole heart. 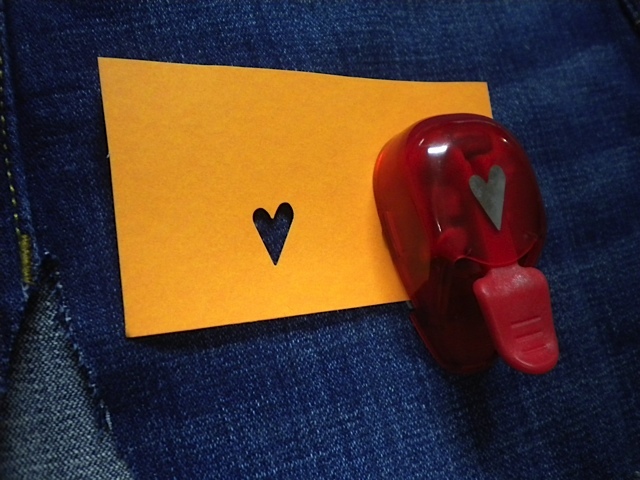 Or you can be completely lazy and use a heart hole punch. I punched two hearts about 1 ½ inches apart. How much space you want between hearts is up to you, though. 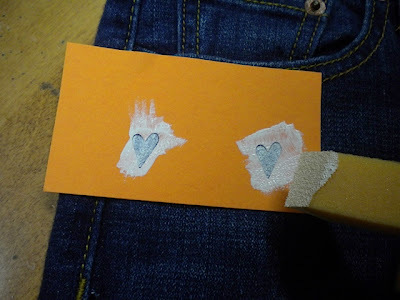 Punching the two hearts makes it easier to keep the hearts in line and equally spaced, otherwise you can get really intense and use a ruler to mark out spots where you will paint hearts. But it is summer, and the livin’ should be easy ... am I right? Once you have assessed your laziness in making hearts, it’s time to get on to the fun part: painting! The key to this is holding the stencil flat to the jeans and using the itsy, bitsy, tiniest amount of paint on your brush as possible to avoid smudging hearts into oblivion. If there are some smudging problems, use a wet dishcloth with some dish soap to quickly wipe up the heart or quickly use the edge of your nail to straighten it out. 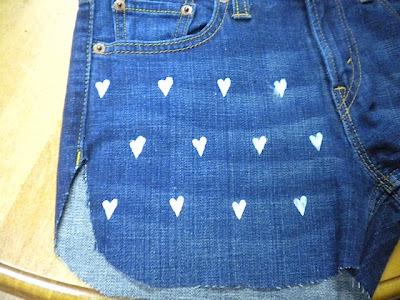 Go on painting a row with your template, making sure there is equal spacing between each stencil duo of hearts. When you go on to the next row, stagger that stuff so that the the pattern doesn’t have too much empty space and generally looks good. Continue doing this pattern until the front is finished. Let the front dry and continue onto the back. It is really up to you how you attack how much you paint. You can just do one side, half of a side, just the back pockets or whatever! Creative freedom at its finest! Try different punches, like circles or stars, for a different look! There you go, you have the ability to punch holes and paint! This is one of the easiest and most rewarding DIYs you can do! So, slip on those shorts (make sure they are dry and make sure you let them dry for a day or so before washing -- read that paint bottle) and be prepared for the onslaught of compliments! Really awesome article!! I'm addicted to denim and I've gone crazy with changing them up cutting them and putting spikes on the front pockets!! Also you should try making denim scarfs! I've made a few and I love them! !